I bought Sharon her first Horrible Adorables original for her birthday this year and the thing about them is that once you own one, you want and entire wall full of them. Think about how amazing that would look in your living room: you're just sitting there watching tv with a hundred heads of whimsical felt creatures staring back at you. Don't be surprised if they break into song from The Muppets catalog of hits. 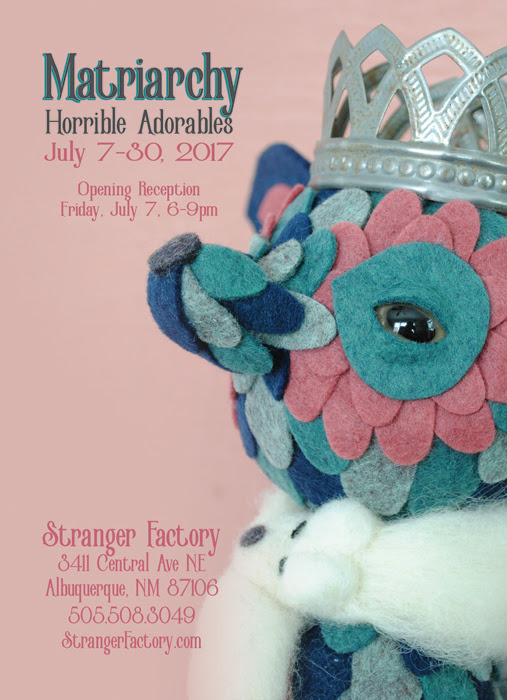 This Friday, July 7th, at Stranger Factory you can witness their latest solo show entitled "Matriarchy." The theme centers around females in the animal kingdom who are boss ladies and the lives that revolve around them. If you're close to Albuquerque you can check it out during the opening reception from 6-9pm, while the show itself will run until the 30th.